This tent by Celina makes use of less hardware than traditional frame tent models do and includes a user-friendly instruction manual for assembly. The cinch top allows for quick installation and provides your tent with a tight, crisp appearance. Not only is 95% of the tent top bonded with heat-sealed construction, but it is also equipped with reinforcement patches at the crowns. 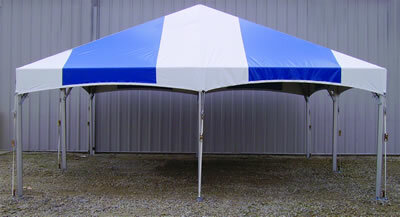 Also included is a durable aluminum pole kit and polyester side curtain with polyester webbing.